seeds, feta, and scallions, all topped with a yellow Sunshine Sauce. Please welcome guest post and my dear friend, Heather K Jones. Hey there, I’m Heather K. Jones. I’m a registered dietitian, a nutrition consultant for Skinnytaste, and the founder of Smaller Size Bigger Life, an online coaching program for women who struggle with emotional eating, binge eating, overeating, or body image issues. 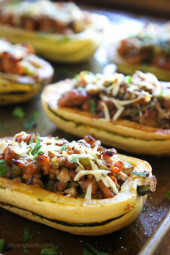 I’m so excited to guest post on Skinnytaste today (thank you, Gina! ), because I’m sharing a recipe from the streets of Seattle… literally! My two sisters and I live in the Seattle neighborhood of Queen Anne, and every Thursday we meet at the local Farmers Market. 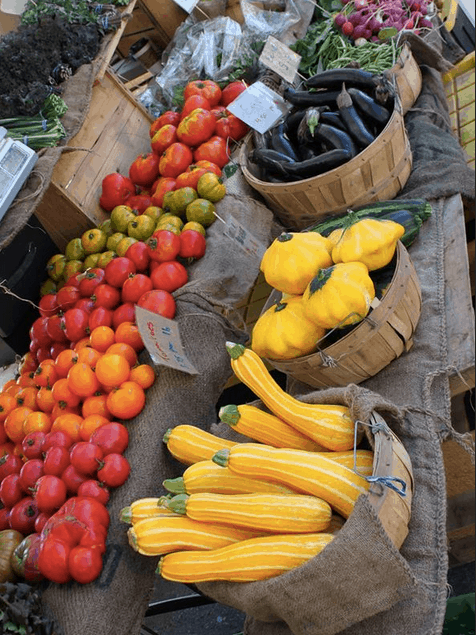 It’s the best place to get the freshest organic produce, as well as local meat, cheese, honey, flowers and more. The market is also a Seattle street-food dream – tons of local food trucks and carts gather at the market each week, and it’s so much fun sampling all of the wonderful dishes. 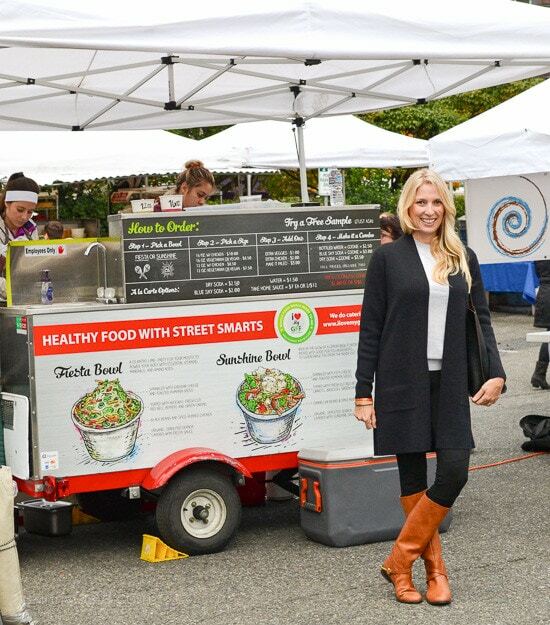 One of our favorite food carts, I Love My GFF (Gluten-Free Food), also happens to be the healthiest. 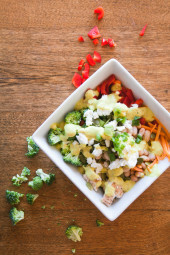 Their signature Sunshine Bowl is a delicious (and nutritious!) mix of quinoa, grilled chicken, white beans, chopped veggies, pumpkin seeds, feta, and scallions, all topped with a yellow Sunshine Sauce. The secret to this bowl is definitely in the sauce—a yummy combo of almonds, lemon, honey, and basil. It took my sister Lori (she’s a wiz in the kitchen) and I a while to re-create the Sunshine Sauce at home, but after a few tries I think we finally nailed it. I hope you enjoy this Sunshine Bowl as much as we do! Soak almonds in 1 cup of water for 2 hours. 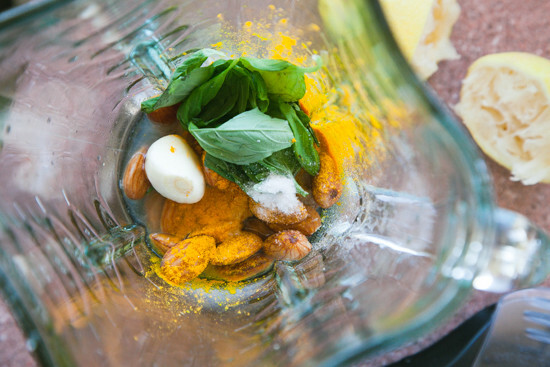 In a blender or Vitamix, combine almonds, 1 cup (fresh) water, lemon juice, garlic, honey, turmeric, salt and basil and blend until completely smooth. Put the sauce in a squeeze bottle. 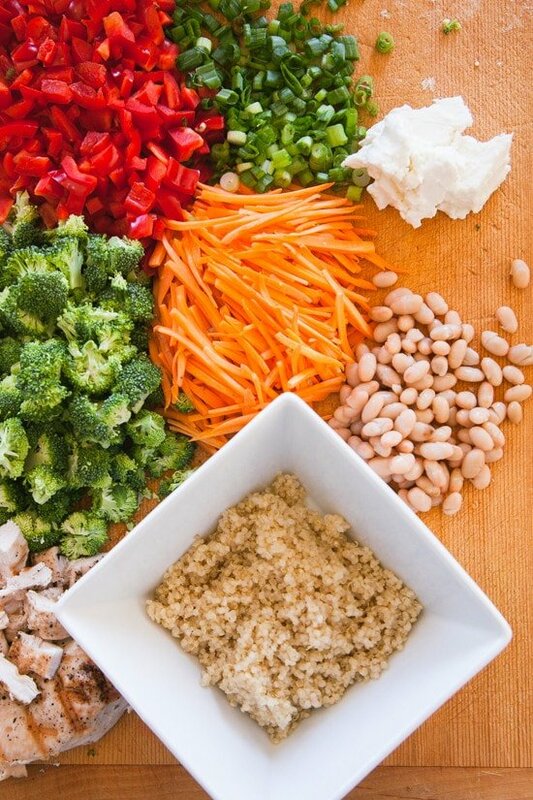 In 4 bowls, evenly distribute the quinoa, chicken, veggies (broccoli, peppers and carrots), and beans. In between layers, squeeze in 2 tablespoons of sauce. Refrigerate extra sauce for up to 5 days—it’s great as a salad dressing or drizzled over meat, poultry or fish. Note: This makes a lot more sauce than you need for 4 bowls. Cover and refrigerate for up to 5 days—you can use the extra as a salad dressing or as a sauce for any cooked meat, poultry, or fish. My daughters and I loved it! We used rotisserie chicken breast to save time. Filling, crunchy, delicious! Made this for an outdoor picnic/concert with friends yesterday. Amazing! I grilled the chicken with teriyaki sauce, refrigerated overnight, and then diced into the salad. I swapped summer squash for the red pepper (have a friend who can’t eat peppers) and used pistachios instead of pumpkin seeds because that’s what I had on hand. I also chose to buy salted almonds….the salt comes off in the water, and then I’ll eat the rest! Wouldn’t be as inclined if they were unsalted. Super fantastic salad…the dressing is definitely the key. 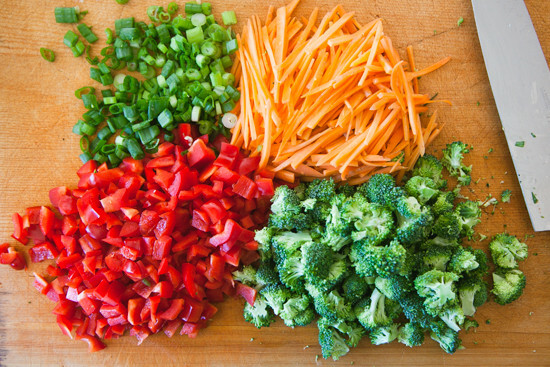 You can use this as palette for many veggies….think zucchini, fresh sweet corn, grilled asparagus, etc. Also would be good with black beans instead of cannelini beans. It’s a good “clear out the fridge” salad! I’m so excited to find this recipe!! I l’ve had this before and need that sunshine sauce!! Can’t wait to try this at home…. Thank you!! Hi. How many tsp of the sauce should go in each bowl? You mentioned between each layer but I was a little confused about how many layers there would be in total. Can’t wait to make this! Also — I also got slivered almonds. Will they work? This sounds really good, but I wish there were directions for the vegetables. Are they supposed to be raw? If not, how am I cooking the broccoli, carrots and peppers? Steam? I wish the recipe elaborated more on this. Also, I wish there was some sort of seasoning for the grilled chicken. I don’t want to just make plain grilled chicken. They should be raw. You can season with salt, pepper, garlic powder and dried oregano if you wish! How thick should the sauce be? Can you add a picture? I found the texture of the sauce mealy. Did others have better results? Not sure what went wrong. Hey Kimberly – did you soak the almonds long enough? This is absolutely fabulous. I used my magic bullet for the dressing. I didn't have cannellini beans so I substituted with lentils. It is so filling and yummy. For the sauce, could you blend it in a small food processor?? Can't wait to try!! Hey Lauren – sure, I think a small food processor would work! Made this tonight and enjoyed while watching the Seahawks – wonderful dressing and salad combination. Substituted black beans for cannellini and only used the juice from one lemon. Excellent tip on the squeeze bottle. Thanks for another great recipe! Made this tonight and my family loved it. I chopped the carrots because I did not want to get my food processor out and I did not have shredded carrots. I did not have Turmeric so I substituted ginger. I made mine meatless, still delicious. Also, only soaked the almonds for an hour so they still had a bit of chunk to them, so next time I will be sure to soak them longer. Hello – just cut the entire recipe in half. I just made the sauce for my lunch tomorrow. It is delicious! I used half the salt and double the honey. I can't wait to try it all together! This looks so yummy. I kind of have food texture issues. Wondering how you sliced your carrots so thin. It says they are "shredded" mine do not turn out so pretty. Pretty food is so much more fun to eat. Can't wait to try this. I have some left over ground almonds from baking. How much would I use, if at all? Hello – I don't think you should substitute almond flour for whole almonds… I think you need to use whole almonds (soaked and blended) to get the sauce to be the right texture. This was amazing as amazing as it looks! We're trying to do a veggie detox at the moment so we skipped the chicken…but I still added the feta! For novice chefs like myself…if you're using dried beans…they take awhile to cook!! anyone know what the WW point value would be without the chicken. It would be around 8 points without the chicken. I have some almond flour I need to use soon. Could I use that instead of whole almonds? Hi Tracy – I would not substitute almond flour for whole almonds… I think you need to use whole almonds (soaked and blended) to get the sauce to be the right texture. I am making this for my vegetarian daughter and omitting the chicken. I think she is going to love this! Can you provide a cup measurement for the lemon juice? Thanks! Hi Amy! According to this site (see link below) one lemon yields around 3 tablespoons juice. Can this be served warm with the vegetables lightly sauteed in the sauce? 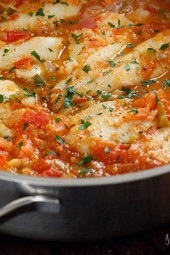 Hello – you could blanch the veggies so they remain crisp, but I think the sauce is best cold or room temperature. This sounds amazing! Can't wait to make it!! Really like this recipe, however the sodium content seems high for someone with blood pressure problems? How much would the taste be affected if I reduced the salt to half or less? Thanks for your response, this looks like a tasty meal. Hello – I think the bowl would taste good with less salt. 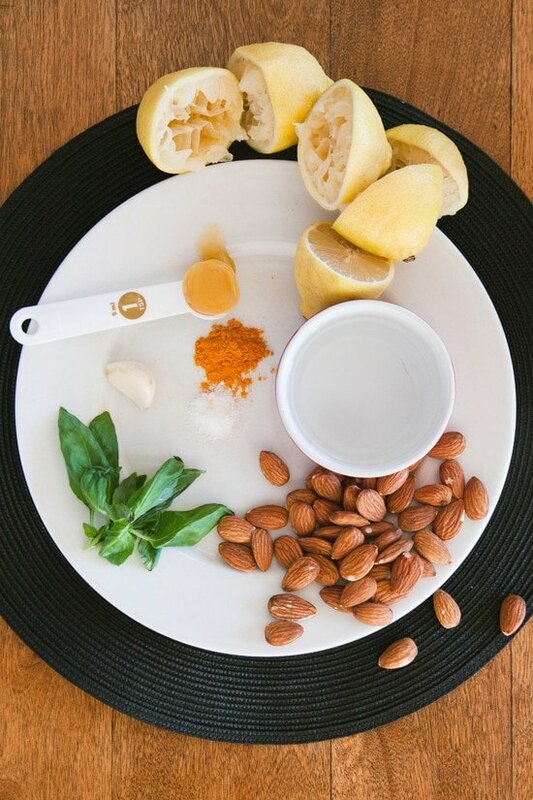 The lemon, basil, garlic, honey and nuts makes the sauce really flavorful! Hi Heather, do the almonds act as a thickner for the sauce or are they there for flavor? We have a nut allergy. I'm wondering if it would be better to eliminate the ingredient altogether or try a substitution? I typically use pumpkin seeds but am thinking the flavor may be off. Your thoughts would be appreciated!! I am wondering the exact same thing! I'm wondering this too. Any luck? We have nut allergies here too! Try swapping with cooked garbanzo beans, or another white bean. Maybe even cooked hominy would substitue? You may need more/less than the almonds. 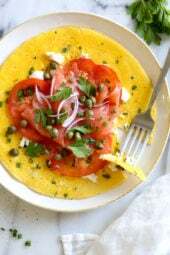 I make a similar sauce for a similar recipe, but it uses garbanzos and nutritional yeast in addition to everything else. I find I get about as much body from pureed garbanzos. I also just made a chili and used pureed hominy to add body, and it worked beautifully. This looks great and I cannot wait to try it! Would it be okay to substitute rice for the quinoa? I know a few gluten-free folks that have been quinoa'ed out and opt out of anything with it. Thank you! Hello – 1 cup of cooked quinoa has 5 points. And 1 cup of cooked brown rice has 5 points. So the points would not change if you swapped rice for quinoa. This looks so good! Can't wait to try it!! Wow – this looks amazing. Thoughts on make ahead options? so if i wanted 2 servings for dinners but 2 servings for lunches (like in a mason jar) would you make it ahead with the layers and the sauce or would you put the sauce separately and pour it on when eating it? Hello! I would wait and put the sauce on right before eating. You could put the cooked quinoa, beans, chopped veggies, seeds and feta in the mason jars. And just store the sauce separately.